In the recent “Keep Sunday Special” campaign against extending “Sunday Trading” it was said frequently that the Lord’s Day is “a family day”. From one point of view this is not correct at all. The Lord’s Day is the Lord’s Day. Yet the fourth commandment does have a lot to say about families. About how they should keep the Lord’s Day together as a day of worship. So in one sense it is a family day. Not a day for the family to do as it wishes and do what pleases them but a day for the family to obtain an eternal perspective. The Larger Catechism (Q117) shows the various matters required in the fourth commandment. One of them is “the public and private exercises of God’s worship”. As well as attending Church, we are to seek to worship God in private in the way described in Isaiah 58:13. As well as personal devotions, this includes family worship: reading and explaining Scripture, prayer and praise. The Lord’s Day provides a golden opportunity for parents to orient their family towards eternal realities. They can have spiritual discussions about the sermon that they have heard and other things that they read together. Catechising is another vital way of saturating the minds of your family in the truth. It is interesting that the Larger Catechism emphasises the family dimension of the fourth commandment. In Q118 it asks “Why is the charge of keeping the sabbath more specially directed to governors of families, and other superiors?” The answer it gives cuts across some of the individualised ideas of religion cherished in our own day. “The charge of keeping the sabbath is more specially directed to governors of families, and other superiors, because they are bound not only to keep it themselves, but to see that it be observed by all those that are under their charge”. Parents have a responsibility to direct their children with wisdom to seek spiritual priorities on this day and lay aside whatever may distract from that. James Durham focusses on how we should worship God privately not only as individuals but as families. He shows how the fourth commandment commands famiy worship, particularly on the Lord’s Day. The following is an updated extract from a free e-book that you can download at the bottom of this post. The fourth commandment (Exodus 20:8-11) requires family worship distinct from public and secret worship. It requires the worship of God amongst those that are related to each other, which is not required of others in the same way. It cannot simply mean the head of the family engaging in secret worship himself and directing the members of the family to seek and worship God separately. Although that is worship, it is not family worship jointly offered by those in a family relationship more than if they were not in such a relationship or family. While it might be said that those individuals kept the Sabbath holy, it could not be said that the family as such did. Even as families seeking God in secret does not replace public worship in the congregation if it is possible to attend. In the same way that this commandment requires a congregation and minister to come together in order to keep the Lord’s Day so it requires a family and its head to worship together. More is required in this commandment than keeping the Sabbath holy individually even within one family distinct from another. If the Lord only addressed individuals in the commandment without repeating son, daughter etc. this would have required secret worship as individuals only. Identifying each members of the whole family must imply something else. Individual duty is implied in all the commandments. Special worship is implied here because the fourth commandment speaks of those within a man’s gates or doors. Ordinarily this does not include the congregation or people from other families. It extends to the members of a family who are within a man’s gates or doors. It must therefore be distinct family worship mainly performed by that family together. The duties required by the Lord’s Day imply this. These include instructing, exhorting and admonishing one another. Comforting, strengthening and talking with one another of the Word (Deuteronomy 6:7-8). These are undeniably duties for the Lord’s Day, but they can only be done together. It follows that family-worship, at least on the Lords-day, is commanded here. If families are called to worship God together on the Lords-day in its particular duties they are also called to worship him jointly on other days in a way befitting to that time. Families are required to worship God in this way on the Lord’s Day. Even if there was no public worship of God to attend. If no other family in the world worshipped God, they are still required to do so. Joshua said that whatever anyone else would do, he and his house would serve the Lord (Joshua 24:15). Sanctifying His sabbath is a special aspect of serving God. Suppose there was no worship of God in the whole world except in one family. This worship would be a joint family worship: “me and my house”. Otherwise, it would be the same as saying that there might be many worshippers of God in the world but they did not need to join together in worship. This is absurd and certainly contrary to Joshua’s religious resolve. 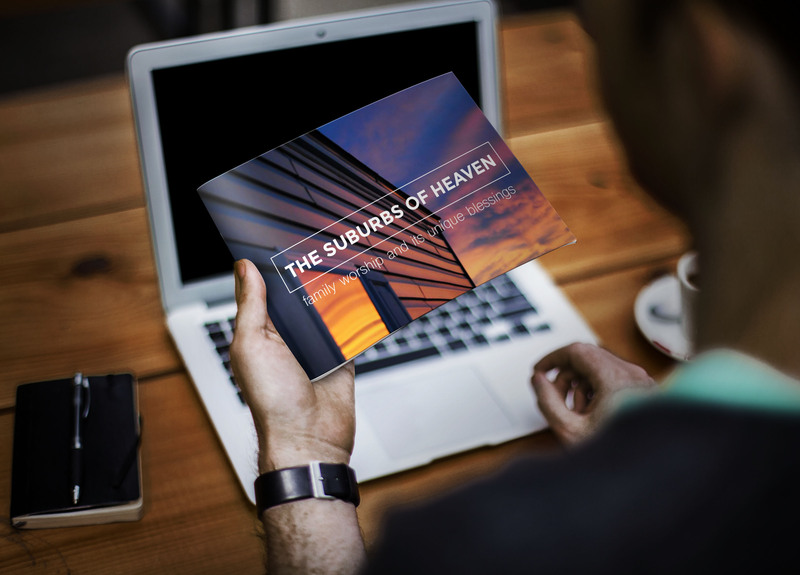 Our online store offers various booklets including one entitled Family Worship. This gives practical guidance in all of the aspects of family worship, including the Lord’s Day. Click here to view sample and purchase. "Family Worship and the Lord's Day" makes a brief but full scriptural case for family worship as a key part of keeping the fourth commandment.